The ride up the Sumida River took us to the Asakusa neighborhood (which had its own level of craziness going on). Across the river from the dock stood one of the most striking structures in the Asakusa skyline -- The Asahi Beer Hall. 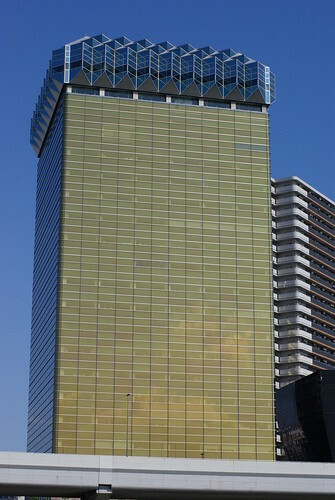 Asahi is is one Japan's largest beer companies. The headquarters features two buildings -- the golden, taller one, meant to evoke a tall glass of beer, and the smaller, more architecturally striking one that people around the world recognize. That thing on top is officially called the "Flaming Ornament," but it is known by many other names as well. 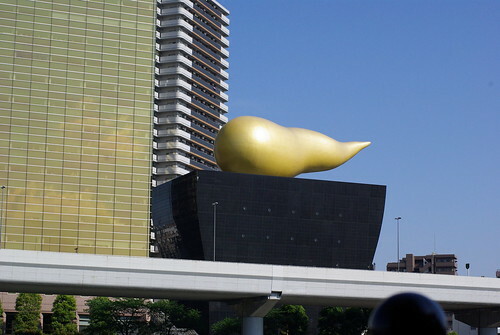 Some refer to it as a parsnip, others by its nickname, "The Golden Turd." It's certainly an odd element to see. The tour guide suggested it lays on its side due to a design error. It was intended to stand up on its bulbous end and really call to mind the the brewery's Dynamic Heart. The flame turned out to be too heavy, though, and the in the end they had to lay it down. (I've haven't confirmed that part of the story, but it seems plausible). More pictures of Tokyo are here. More of my Tokyo Travels posts are here. After the Imperial Palace we headed over to the river for a short ride. The cruise up the Sumida River took about a half hour. It was a beautiful day; the weather was perfect for a boat ride to Asakusa. We all lined up to board at the dock. Those of use from the bus got on, and then more people got on. And more people got on. And more people got on. It seemed like there were several hundred people packed on to the boat. We decided to skip the comfy seats and head for the benches in the stern. That was the right choice. No one was blocking our views. The only problem with it, was that to shoot video, I had to contort myself into a position that might qualify as a Cirque du Soleil audition. But it was worth it. We passed by the Rainbow Bridge with the Fuji TV building in the background, the Tsukiji Fish Market, homes, office, bridges, the new Tokyo Tower, and the Asahi Brewery on our way up the river. This 3 minute, 47 second video has the highlights. The backgound music is "Beautiful" by Hiroumi. If you would like to take the whole 28-minute ride with us, you can see the raw footage here (Part 1 and Part 2). 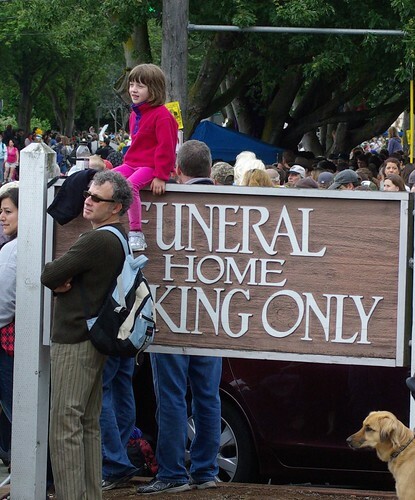 The Fremont Solstice Parade happens every June in Seattle. It's best known for one of its unofficial element -- the naked bike ride that leads it off. Hundred of people don bike helmets and body paint to welcome the summer weather. Or in the case of this year, the drizzle. You can see all my pictures from this event here. You can easily see different the different comfort levels some people have with their bodies. Some people are comfortable enough just to don a full costume of paint and ride with friends. Some are comfortable enough to ride by themselves. Some will let loose their inner rebel pilot. Some are willing to forgo most of the body paint. Some are comfortable enough that if they are late and miss the starting point, they'll still enter the parade. Some are comfortable enough to stand around in crowd of clothed people, chatting with their friends while wearing only body paint. But it takes real confidence to sit down in a restaurant after the parade and have lunch while you enjoy your body paint. Props to all those riders who entertained the thousands of onlookers. I mentioned before that the zucchini is doing fairly well. That's fortunate because the GF is a big fan of it. I started this year's zucchini from seed and got it outdoors in May. I'm growing some plants in and Earthbox and others in terra cotta. They're both producing at decent levels. 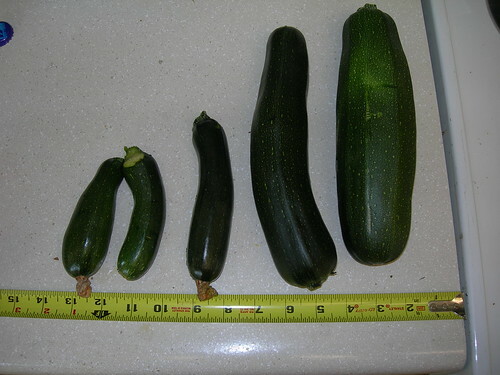 Each week, I can harvest at least 5-6 baby zukes and some really big ones. These are the ones I harvested on 2010-07-21. 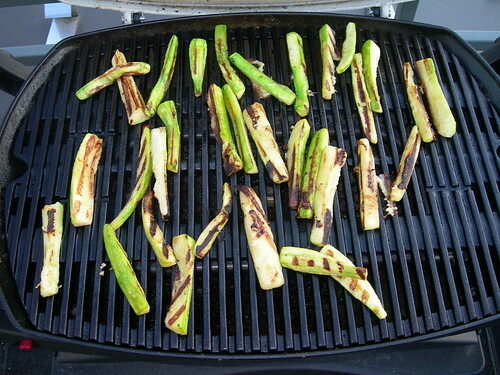 I coated them with salt, pepper, and oil (at the direction of The GF (it turns out I did it wrong -- I was supposed to oil the grill, not the zukes. Oops. ) (my expertise ends when they are no longer attached to the plant)). 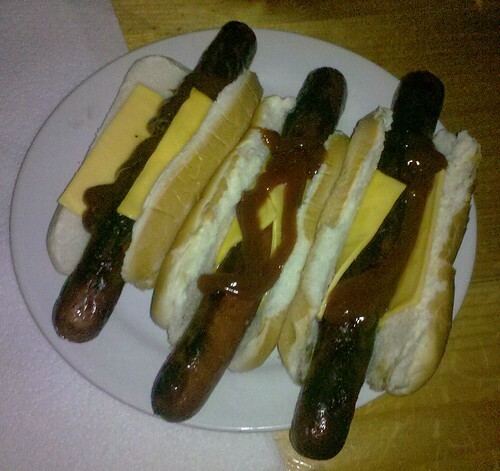 Then I tossed them on the grill. 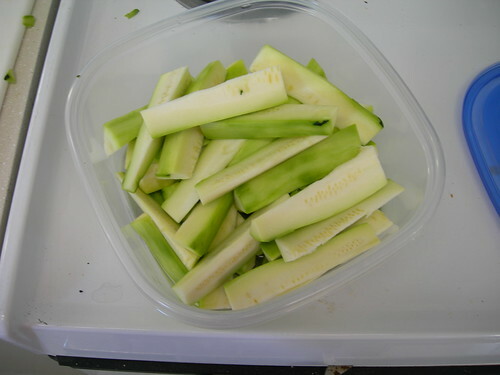 We ended up with some tasty and healthful (if unattractive) snacks. 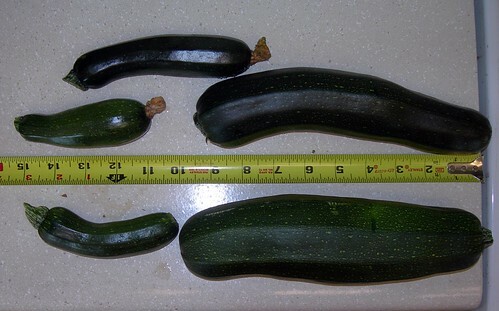 Perhaps next year, I'll add one more zucchini plant to the mix. Enough so we don't run out -- not so much that we get sick of them. I mentioned Jamendo on Twitter a couple weeks back. It's a pretty neat site. Jamendo is a site where musicians share their music for free. You can download thousands of tracks and albums from new artists and explore wide range of genres. By free, I mean the music is available under a Creative Commons copyright. Unlike traditional copyright, which reserves all rights to the owner (except, of course, the right to fair use, despite what some holders might claim), a Creative Commons copyright grants explicit rights to reproduce and reuse the content in many ways. For example, you may recall my w00tstock! videos. At most concerts, you will be kicked out for recording the performances. At w00tstock! they encourage you to record and post it -- for noncommercial purposes. Most of the videos I post to YouTube I release under a Creative Commons Attribution-NonCommercial-ShareAlike license. Most of the content on Jamendo is under a similar license. That means you can download it for free, copy it for free, and share it with friends for free -- as long as you comply with the rather liberal copyright terms. You can search by genre, country, license, and more. When I was looking for some music from Japan for an upcoming blog post, I downloaded dozens of tracks from Jamendo until I found just the right one. And I can use that in my projects without fear of a take down notice. The other music I found will just go on my iPod. If you are a blogger and looking for music for a post or project, check out the libraries on Jamendo. If you are interested in the new wave of intellectual property and the social experiment of how new artists share their music with audiences around the world -- without a big music label making all the decisions, check out Jamendo. If you just want to hear what is possible without a big studio, you guessed it, check out Jamendo. We zipped up the freeway a weekend afternoon to run some errands. It was over 90 degrees out so we had the windows open to soak up some rare Seattle warmth. We hit the area just south of the 85 ST exit and heard a rumble coming from the back. That's always been a noisy stretch of freeway, so I didn't think too much of it at first. Then The GF mentioned something didn't sound right. I thought it was just loud. Then I began to feel some odd, subtle vibrations. I looked in the rear view mirror and saw bits of rubber flying off behind the car. That was my second clue that something was wrong. Traffic was light enough that I had no trouble merging over to the right as I gradually slowed. I made it to the offramp and eventually on to the side streets. My total drive distance since the vibration first presented itself was about a half mile. While there was a subtle vibration, there was practically no difference in handling. The car behaved reasonably smoothly at all times. It accelerated as I expected, and the brakes felt pretty much like they normally do. I had no steering problems. While something definitely did not feel right, the car performed safely the whole time. I didn't think the damage would be too serious. When I finally found a safe place to stop, I was astonished to see this. I've had tires fail before, but never had such a complete blowout/disintegration. That fact that the car performed so well despite this serious damage is a testament to the design and engineering that goes into a Subaru. 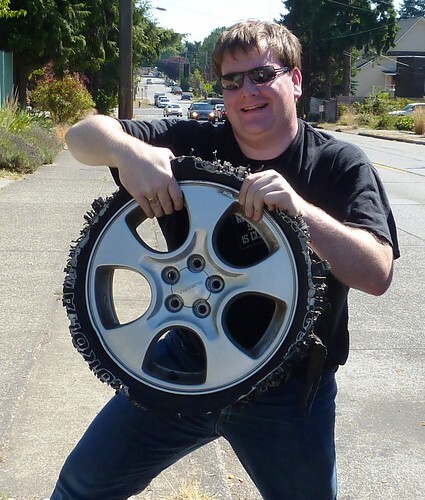 I popped on the full-sized spare tire and we changed plans. Next stop was the Costco tire store for new tires. 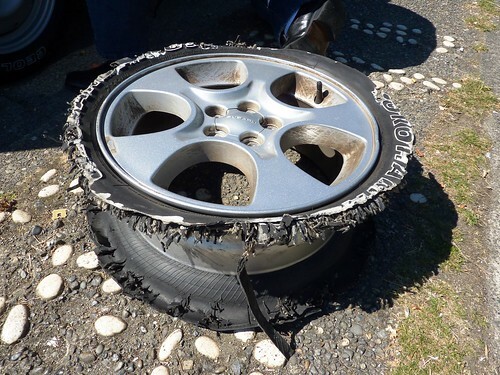 I'm not sure why the tire failed. They are the factory-original tires. I think they were rated for 50K miles. I've only got 42,000 miles on the car, but it is 7 years old. I was planning to replace the tires before the fall, anyway. This incident provided the encouragement to speed up that process. Costco put a fresh set of 60K Michelin tires on the car. With as much as I drive, I'll probably have these for another decade or so. I'm pleased with the new tires. The car seems to ride a little higher, but more importantly, the car rides significantly more quietly. 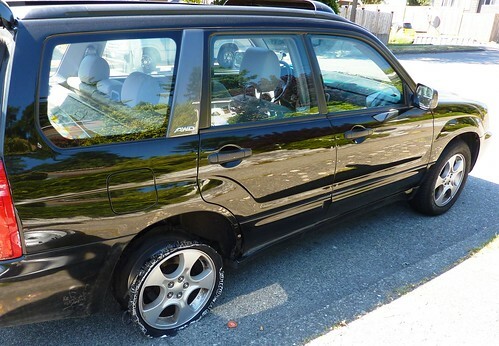 The cabin noise has always been one of the biggest negatives to my 2004 Subaru Forester, but the new tires seem to make a big difference. So while I definitely did not want to spend hundreds of dollars that day, it was money that needed to spent. 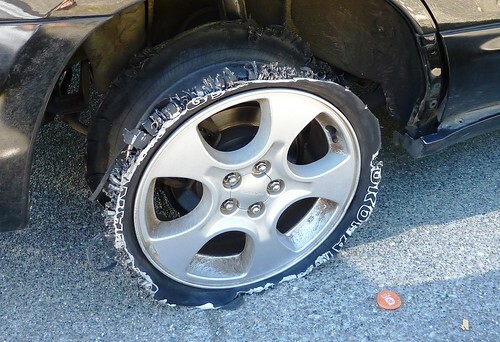 And I only needed to pay the state disposal fee for three tires, instead of four, since the car itself gradually disposed of one tire across a half mile of Interstate 5. And I can look forward to thousands of miles of safe driving in the years ahead. It's now over two feet tall. You see those bare stalks? That's not because the plant got leggy. It's because I've been eating the leaves. 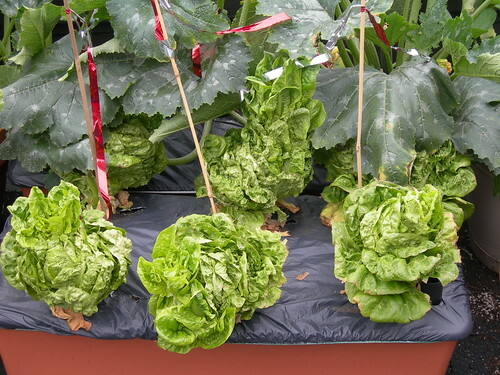 Romaine grown in the Earthbox has been one my most successful crops this year. It's also been extremely easy. But we may be hitting the end of it. There are tiny flower at the tops of the stalks. 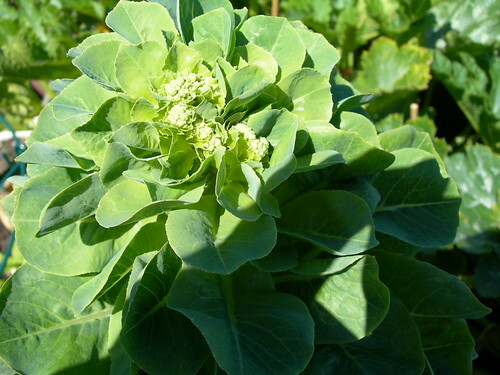 Leafy vegetables grow flowers to produce seeds to make more plants. In other words, once it flowers fully, its genetic destiny is done. The best way to stretch the growing season is to remove those flower early -- literally nip them in the bud. 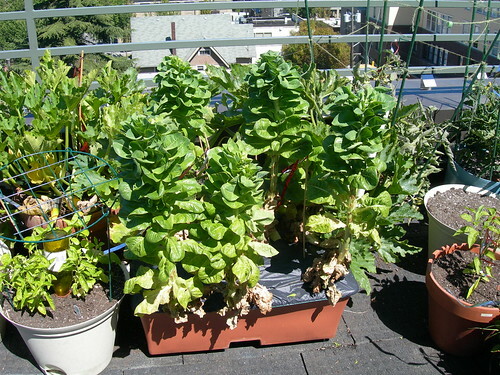 When you do that, hopefully, the plant will focus on producing leaves for dozens of salads yet to be eaten. The more immediate result, though, is the Romaine milk. Sap, really. 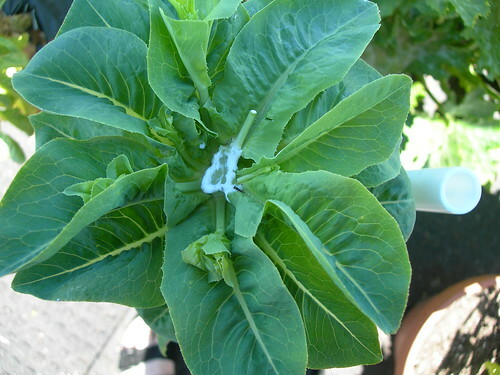 When you pull or pinch off the flowers, the sticky, thick, white liquid oozes up out of the stem. Here's a tip. Don't eat the liquid. The Romaine flavor is strong in liquid, but so is the bitter, sour flavor that apparently evolved to discourage small, woodland critters from eating the stalks. Regardless, it's great to have a fresh head out on the deck at all times. I can head out there to water the plants, munch on a strawberry, a string bean, and the tear off a lettuce leaf, all without going to the grocery store. Next year -- even more greens. Past Life in the Garden posts are available here. After lunch, the Imperial Palace was the next stop on our tour. It wasn't as interesting as many of the other stops. We pulled into the parking lot and then walked a ways through the hot Tokyo afternoon. We passed school groups, joggers, business people, and college students enjoying their afternoons. And, of course, a myriad of other tour groups following their own tour guides with their own banners on sticks. 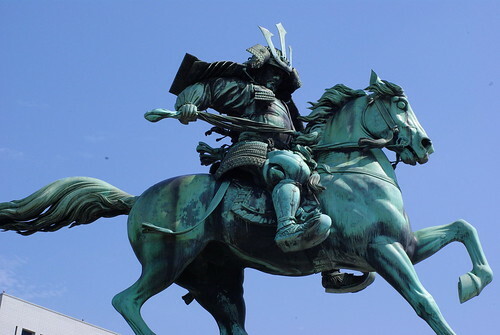 The most striking object I saw was the statue of Samurai Kushunoki Masahige. He faces the palace as a show of loyalty, rather than facing away from it as is traditional. At least I think that's the story; I could be recalling wrong. I'm sure someone will correct me if that's the case. 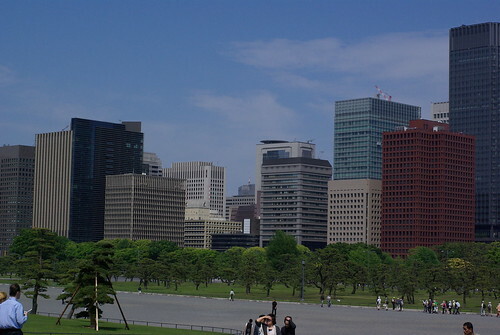 The palace grounds are a popular park, right in the heart of Tokyo's commercial sector. 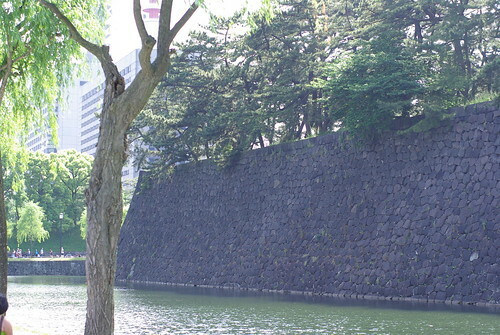 If you're looking to pass some time in Tokyo, the grounds are probably a great stop. There are some wonderful people watching opportunities here, but if you are on a tight tourism schedule, you can probably skip it. The East Gardens might be the better option for touring. What can you see? 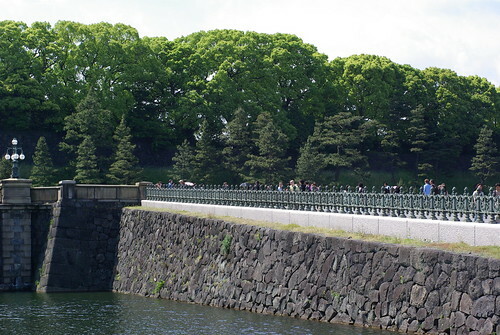 Well, you can see the bridges that guard the entrance to the Imperial Palace. 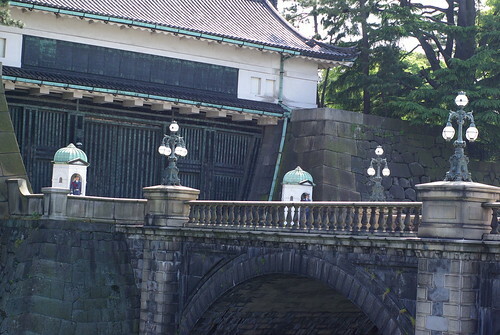 There are two of them -- The Eyeglass Bridge (the name comes from the arches) and the Nijubashi bridge (which basically means "double bridge"). In this image, you mainly see the first bridge. The railing for the second bridge is barely visible in the background. To get to the palace in the background, you cross the first bridge, pass through a guard house, make a U-turn and cross the second bridge. Even though the palace is closed to the public all but two days of the year, the guards still attend their stations. 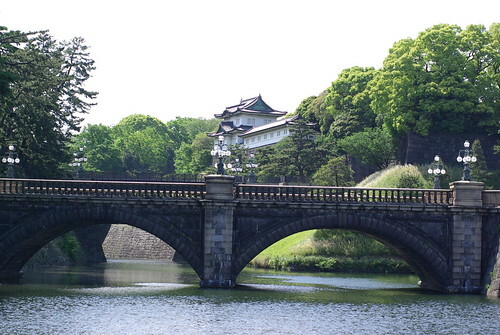 There are fascinating stories about the palace and the history of Japan. From that perspective it's a great place to visit. From a bus tour perspective, though, there's not much going on in this stop. Perhaps the best way to visit the palace as a tourist would be to take a picnic lunch, enjoy that on the grounds, watch the locals, go see the bridges, then head over to the East Gardens. I'm tempted to vote for Goodspaceguy just because it would be awesome to hear about Senator Goodspaceguy on CSPAN. Too bad about Mike The Mover, though. 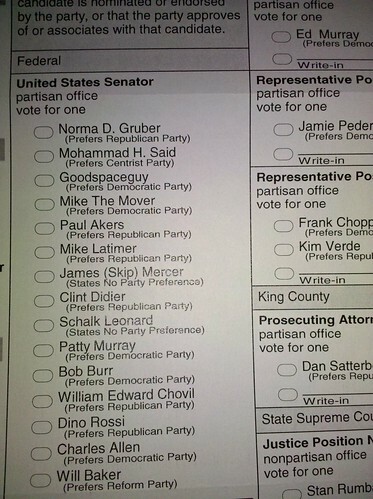 He probably thought he would have the most unusual name on the ballot. Senator Mike The Mover still has a neat ring to it, though. You can also follow the link here. Chinzan-so is one of the many oases of green in the heart of Tokyo’s concrete panels, and it was where we stopped for lunch on our Hato bus tour. We entered the garden through the Four Seasons hotel and, like at the tea ceremony, first dodged several wedding parties on our way to Mokushundo. Delight in the Japanese style of barbeque on a stone grill created from molten lava from none other than Mount Fuji. The vast Japanese garden before your eyes is so grand—it will make you wonder if you are really in the middle of Tokyo! We shuffled into the restaurant and sat around 3 sides of the 4-sided tables. The fourth side was open so the staff could cook for us. It sounds similar to Teppanyaki, but it’s different. In Teppanyaki, the cook is basically sauteeing on an iron, hot surface. The cook constantly moves stuff around, and entertains the guests. The cook is also often in the middle of a horseshoe, again making the cook the center of attention. At Mokushundo, the cook heats up the stone, places food on it to cook, and serves the diners. This style places the focus on the food and the guests. While it is certainly entertaining, it’s not a show in the way Teppanyaki is. We started with a small salad. And then they started cooking meat and vegetables. Lunch was light and tasty. It was a nice, relaxing environment. It would be a great place to go for an extended lunch to catch up with old friends after a long absence. It’s also an example of something I’m not sure I would have discovered on my own. The restaurant is only half the story, though. The Chinzan-so gardens are amazing. When you look ahead, all you see is lush greenery (and brides). When you look up, you see the structures of modern Tokyo poking up beyond the trees – almost, but not quite, intruding on the peace of the garden. This well has been ranked among the excellent waters in Tokyo since ancient time. Originally it is underground water from Chichibu Mountains. The little alkaline water, containing many minerals and calcium. In the big earthquake (Kanto Daishinsai), the water was open to the victims to fill their thirst. 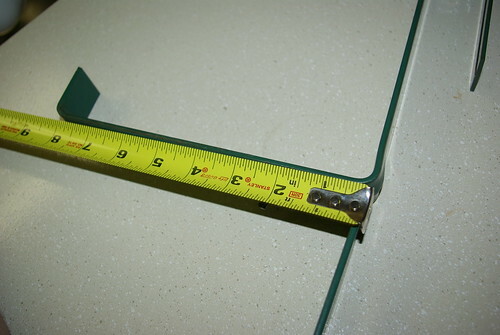 It is a square well; the side is 90 centimeters. Nearby is a happy statue of Ebisu. He is a god of inviting good fortune while keeping away calamities, especially safety and prosperity of transportation, fishery and commerce. He is a guardian deity of the people who enjoy fishing, sailing, and scuba diving. The main walk also features 500 year old Stone Statues of Rakan in various stages of weathering. Here is what that placard had to say. Work of 16th century. The stone statues are carved in the image of Buddhism priest. They removed here from temples in Kyoto and Toba. It was a beautiful property on a beautiful day. More pictures of the lunch trip are here. I shop at REI from time to time. 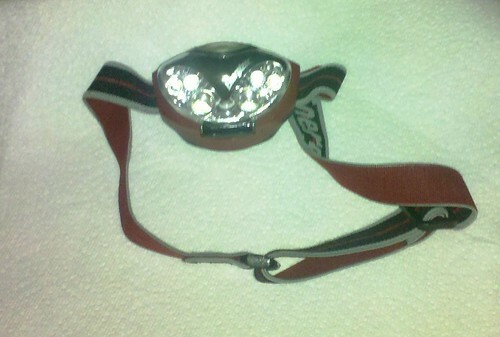 It's where I picked up my hiking/biking head light. 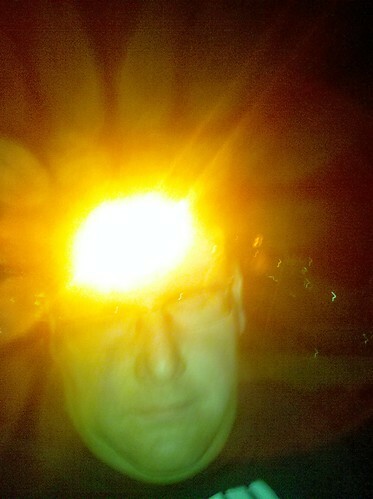 Those of you who don't know me, can easily imagine me covering miles at dawn. Those of you who do know me are doubled over with laugher. I use it primarily when I have to check on my plants after a trip. Or when my vampiric tendencies render me hungry after dark. Afterall, what better tool is there when you get the urge to fire up the grill at 11:00 PM? In the same week I listened to podcast interviews with two of my favorite authors. Chris Hardwick of The Nerdist interviewed Scott Sigler, while Matt and Shannon of Seattle-Geekly interviewed Marjorie Liu. If you are a fan of geek culture at all, or the process of stand-up comedy in particular, you should be listening to The Nerdist podcast. Add Seattle-Geekly if you live in Western Washington. The problem with the interviews is that they barely talked about the books I read. The Sigler interview was fantastic, covering both culture and process. Sure, Sigler was there to promote Ancestor, but I wish they would have spoken more about Infected and Contagious. I suppose spoilers could make it problematic, for new listeners, but I still wanted to hear more. The Liu interview seemed to be more of a missed opportunity. I'm guessing that Matt and Shannon were not too familiar with the Hunter Kiss series. The books take place predominantly in Seattle, and Liu lived in Seattle for many years. Rather than just exploring Liu's geek nature (which is still awesome), and her new video game adaptation, I wish they would have spoken more specifically about Seattle and the influence the city has had on Liu's writing. The strength of the Seattle-Geekly cast is the local tie. Instead, the interview (while still good) could have been done by a podcast in most any other city. Despite those concerns, these were both good shows. Ancestor is the next book I need to read, and now I need to add Feed to my list (thanks to the podcast). Plus, the latest Seattle-Geekly episode just introduced me to some awesome geek musicians. The shows are worth subscribing to. I am amazed at how hard they are to find. Most brackets on the market have two problems. 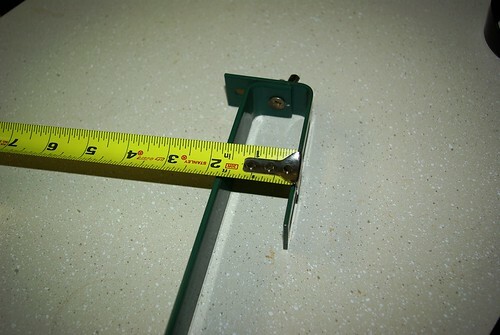 First, they often assume a railing wider than 1.5". 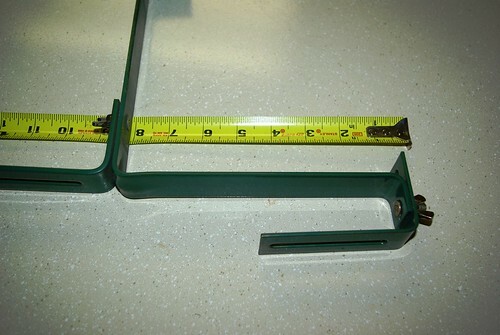 Secondly, they assume that the vertical supports for the railing will be 18" or so apart. They don't work on my deck. 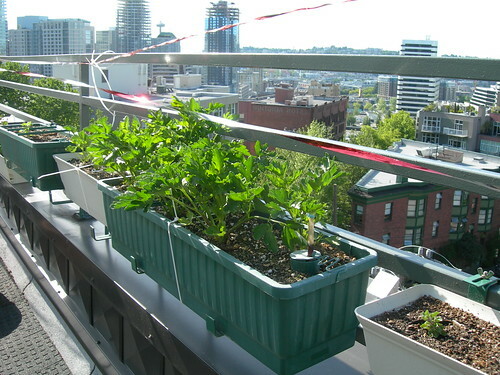 When I try them, the planter invariably swings precariously. The brackets I currently use are awesome, but I can't find them any place. The great thing about this design is the tail at the bottom. 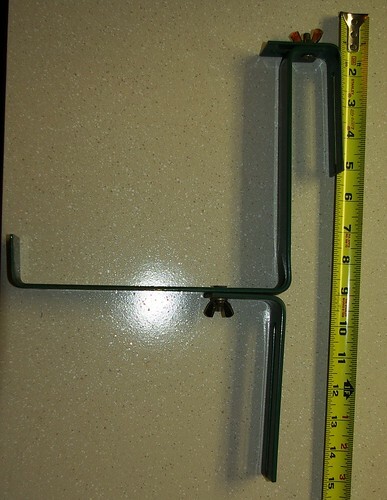 While the tray support the weight of the planter, and the hook puts the weight on the railing, the tail at the bottom keeps the planter level. Because it leans against the rail below, it prevents the window box from swinging. I've been to nurseries, hardware stores, general merchandise stores and still have had not luck finding them. I got my first set when I bought some self-watering window boxes from Gardeners.com. They came with the window box. Unfortunately, they don't appear to sell them separately, and $40 for the window box seems a bit steep, especially since I have enough window boxes. Any suggestions? Perhaps it's time to seek out someone who knows how to build things like this.